This year, we will be holding a School Run4Fun Colour Explosion as our major fundraising event on Friday 26th October. Organised by our SRC and parent network, this event is designed to raise much needed money for school projects. 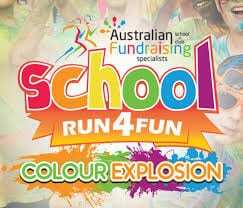 The School Run4Fun Colour Explosion promotes healthy and active lifestyles while helping us raise funds! It’s all about participation, with students treated to a great day as a reward for their fundraising efforts. Family support is key to our fundraising success and we encourage everyone to get involved. All students are able to participate in this event. We do ask that you bring a spare change of clothes to school, most importantly a plain white shirt as the students will be covered in powder from head to toe. The colour powder used in our event has been sourced direct from India, the home of Holi Powder. It is made of high quality corn starch and permitted food colours. It’s non-toxic, biodegradable, skin safe and environmentally friendly. Toxicological Risk Assessment and ingredient listings can be obtained from the School Office upon request. If you have any concerns at all about safety, children are welcome to wear swimming goggles or sunglasses as eye protection and/or bandanas or scarves around their noses and mouths. If you have specific concerns about your child and their health needs, please talk to your child’s teacher. What if my child needs to opt out? If children wish to not be squirted with colour, due to concerns of asthma or allergies or any other reason, they can bypass the colour stations and will not be squirted. Children who do not wish to be squirted may also choose to wear a bright coloured Tshirt (instead of a white one) as a way to still be colourful on the day and to signal that they do not wish to be in contact with the powder. Students have now received a Sponsorship Form with instructions on how to raise money and order prizes. Students obtain donations in cash using the Sponsorship Form together with online fundraising. Students who raise as little as $10 or more will receive an incentive prize for their efforts. But why not aim higher? You have the option to choose up to five (5) prizes and this will set your fundraising goal. Family and friends are your greatest supporters, so ask them first for your support. You will reach your fundraising goal in no time. Create a Student Profile Page at www.myprofilepage.com.au which is unique to you. There are also some great features like recording your sponsorships and selecting your prize goal. You can also register for online fundraising. It’s the easiest way to help your child raise money and to reach your fundraising goal sooner. The average raised per student using online fundraising is $120. WIN A SHARE OF $70,000 WORTH OF FREE SPONSORSHIP DONATIONS.Create a Student Profile Page at www.myprofilepage.com.au and enter your unique code found on page five (5) of your Sponsorship Form to see if you’re an instant winner. Give your fundraising goal a kick start! 2. Complete the back page of the Sponsorship Form and return to the school. Please note, all donations need to be finalised on or before Colour Run day, 26thOctober. Student prizes will be delivered shortly after. Thank you in advance for your participation, and get ready for a BLAST OF COLOUR! More specific details about the day will be shared closer to the event.